Adding, editing and deleting events is done via the Event window, which can be opened in several ways as explained below. -by dragging a certain part of the day in week or day views. Each way will open the Add Event window with a form to enter the event data. Certain fields of the form will be pre-filled, depending on which of the above ways is used to add an event. The venue, category and description fields are optional. Selecting a category will color-code the event in all views according to the category colors. The venue and description will pop up when hovering over events in the various calendar views. URLs added in the event description will be automatically converted to hyperlinks which can be selected in various views and in notification emails. Thumbnails can be "put" in the text, and can be shown directly and/or when howering over the event. A private event will only be visible to you, and not to others. You can attach files ( max. 2 Mb ) of the following types : jpg, png, gig and pdf. You can add more files and of different types. When an event is mailed, the link to this file(s) are mailed as well, and the user can click on those links, and view the file. If attachments are visible and are mailed, depend on the settings. If uploading files, are allowed or not, depends on the settings in the usergroup. The End Date is optional and can be used for multi-day events. Dates and times can be entered manually or via the date and time picker buttons. Click the change button to open a dialogue box in which events can be defined as repeating. In this case the event will be repeated as specified from start date to 'until date'. If no 'until date' is specified, the event will repeat for ever, which is particularly useful for birthdays. The Send mail feature allows you to send an email reminder to one or more email addresses. 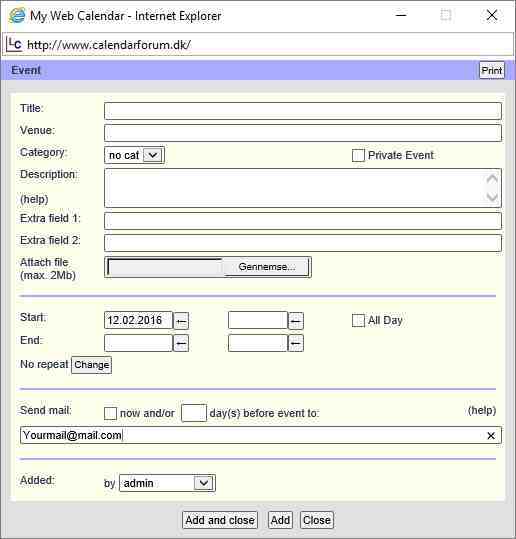 The user can send an email 'now' if the appropriate box is checked, and can also define the number days before an event starts in order to send out an email. In the latter case, an email reminder will also be sent on the date of the event. If no number of days is specified, no email will be sent. If the number of days is set to '0' an email reminder will be sent on the event day only. For repeating events, an email reminder will be sent the defined number of days before each occurrence of the event and on the date of each occurrence of the event. The email list can contain email addresses and/or the name (without file extension) of a predefined email list file, all separated by a semicolon. The predefined email list must be a text file with extension ".txt" in the "emlists/" directory with an email address on each line. The file name may not contain the "@" character. Upon completion, press Add Event. In each of the calendar views an event can be clicked to open a window containing all event details. A user with sufficient rights can edit, duplicate or delete the event. Depending on your access rights, you can view events, view/edit/delete your own events or view/edit/delete all events, including the events of other users. For a description of the fields, see the description for Add Event above. In the Edit Event window, the buttons at the bottom allow the user to save an edited event, save an edited event as a new event (to duplicate the event on another date, for instance) or delete the event. Please note that selecting Delete will instantly delete the event from the calendar, without asking for confirmation. Deleting a recurring event will delete all instances of the event, not just one specific date.